We all live for convenience especially when it comes to food and our health. Just like the myth that healthy eating is expensive, many people believe that buying in-season fruits and vegetables is just too much hassle. After all, Wal-Mart and Target don’t exactly tell you what is seasonal and what is not. So, where do you start? And how can you be sure it will even make a difference? Isn’t it good enough to just eat fruits and vegetables in the first place? The first step in eating seasonally can be as simple as going to your local farmer’s market. But if you’re not sure WHY you should give up your Saturday morning in search of fresh, seasonal fruits and veggies, here are 10 great reasons to add that local shop to your weekend routine. Freshly picked produce that has been allowed to fully ripen in the sun taste amazing – crispy, fragrant, juicy and colorful. Those summer heirloom tomatoes make all other tomatoes seem inferior. You can eat it like an apple; raw, warm from the sun and straight from the vine. Simply supply and demand. When there’s abundance of a product, such as watermelons in the summer, the prices go down. Seasonal food is much cheaper to produce for the farmers who would rather sell their products for a lower price than not at all. Cash in on this seasonal bounty. 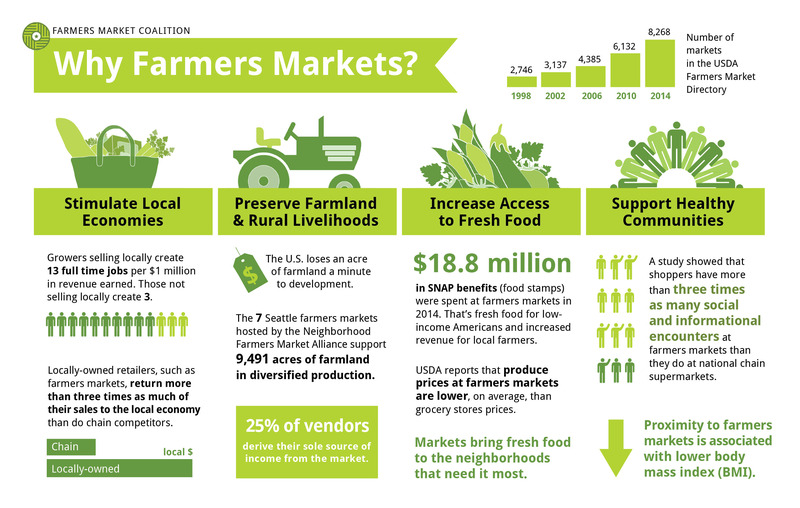 Below is a great resource from the Farmer’s Market Coalition that demonstrates the strong ties between farmer’s markets and the economy, as well as your health! Seasonal produce can grow without too much added human assistance (i.e. pesticides and genetic modification.) We know how these toxic compounds can contaminate the water and soil and also our health. Seasonal food is also more likely to be locally produced, which reduces the load on our environment due to transport, or “food mileage”. Getting to know where your food is coming from, who is growing your food and how they do it also makes you feel more connected to that whole process. Farmer’s markets create communities around food that encourage us to share our knowledge, ask questions and engage in our own local environment. Together, we are more powerful and can facilitate big change. Eating seasonally also forces you to cook more, and there really is nothing better you could do for your health. When you start to take back control of what you put in to your body (the oils you choose to cook with, how much sugar and salt you add to your food, etc. ), you will consciously make even more good choices for your health. Cooking is also a great activity to do with your kids, family and friends. And, what better way to show your love? Kitchn.com has a great blog post titled “10 Meals Straight from the Farmer’s Market” to help you figure out what to do with all the goodies you bring home! Our personal favorite is the potato, squash and goat chees gratin. Eating seasonally keeps challenging your creativity to come up with new, fun and delicious dishes based on what you find. Try your hand on that new Rachel Ray recipe, find inspiration in old cookbooks or go on Pinterest to find new ideas about what to do with all that kale. Variety is also healthy for our bodies. By changing our menu according to what’s available you are also less likely to develop food intolerances. The natural cycle of produce is perfectly designed to support our health. Apples grow in the fall, which makes them the perfect transition food to rid of excess heat and cool down before winter. In spring, an abundance of leafy greens help us alkalize, detox and lose some extra pounds after a long winter of heavier foods. In the summer we need to cool down and stay hydrated by eating more fruits, berries, cucumber and watermelon. Building a lifestyle around seasonal food facilitates the body’s natural healing process! Here’s a great infographic from AngieBryan.com that shows exactly what each green does for our bodies. Be sure to mix them up to get the full benefit, and if you are eating seasonally that is a lot easier to do. Food grown outside of season or natural environment need a lot more human assistance in forms of pesticides, waxes, chemicals and preservatives to grow and look appealing to us consumers. By choosing local and seasonal food, you are also more likely to get a cleaner product! Many small family farms cannot afford to go through organic certification; however they still follow a very natural and healthy growing practice. When shopping at your local farmer’s market, you don’t have to be as careful about finding the “organic” produce as you are when shopping at the super market. Living in tune with natures makes us more aware and appreciative of the beauty around us. We can live in balance with our surroundings instead of butting against and living in conflict with nature. Embracing the natural rhythm of things also helps simplify our lives. The options are limited, and we can trust that our food is nourishing and good for us! It’s really important to note that it’s not always possible to eat seasonally and locally all of the time. As with anything, it comes down to balance. Eat seasonally when you can, and as long as you are making decisions that are better for your wallet and your health, you will do just fine!